In 2018, my good friend of 13 years, Jamila Rowser, wrote her first comic book called Wash Day. So many people bought it and many research libraries and institutions have already acquired it for their permanent collections. It was named one of the best comics of 2018 by The Comic Journal. In short, it is amazing! 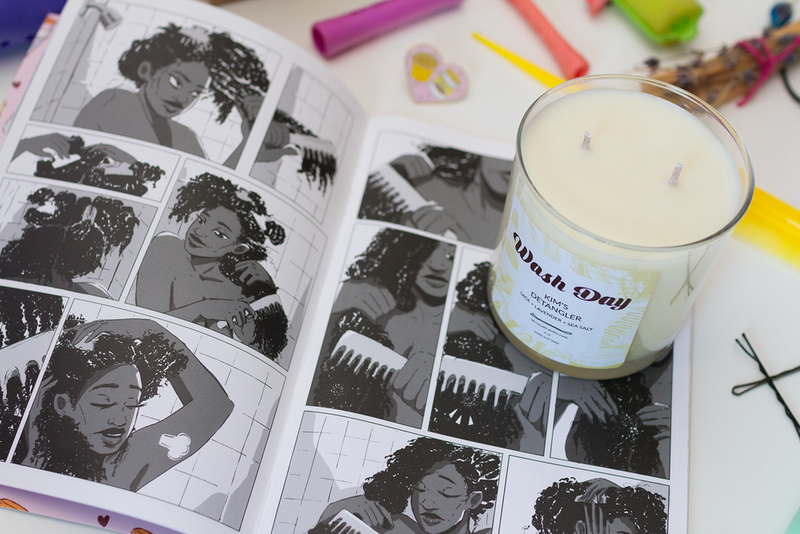 We therefore collaborated to create limited-edition hand-poured, soy wax candles inspired by the characters of this wonderful comic! And we did so via a special “Make 100” campaign on Kickstarter. We are happy to announce that it was fully funded + some! Thank you, thank you, thank you! 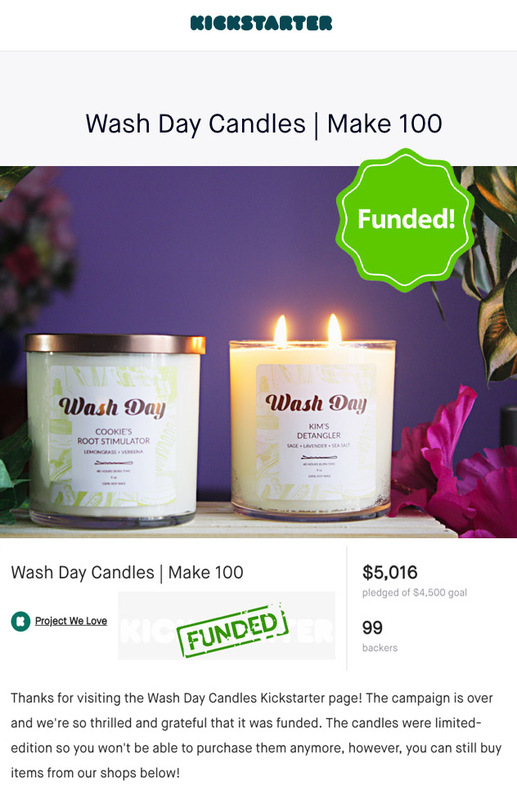 It is hard work doing a Kickstarter campaign but these candles are going to be bomb! For those who backed the campaign, please check your emails for a survey with details on how to claim your rewards. “Kim’s Detangler” features the refreshing fragrances of Sage Leaf, Sea Salt and the relaxing aromatherapy-darling, Lavender. This candle fills the room with a rejuvenating floral-like fragrance that will help ease tension and create a calming atmosphere. “Cookie’s Root Stimulator” is made with the invigorating Lemongrass and Verbena fragrances. This blend releases an energizing citrus aroma that will gently uplift the senses and help brighten your mood. Rich Earth & All Of Its Goodness! In the summer of 2016, I visited a plantation in Barbados where Sea Island cotton is harvested. It was truly an incredible experience as I reflected on those that came before us. Those that toiled against their will to provide the world with the commodity of cotton. Those that were enslaved and forced to work that very same plantation. I was humbled. The luxury that is Sea Island cotton, was new information to me. I had known that it was arguably the finest cotton in the world, but I did not know that it was still in such high demand amongst luxury brands. I decided to use this cotton to make my wicks because of its durability. Traditional, manufactured wicks are not remotely as firm. And they burn quicker. I therefore knew that a candle made with this special wick would make a wonderful household item. I quite literally hand braid the woven cotton myself. This is why making this candle takes me so long. I bought the cotton in Barbados in a loose woven spool, and transported it back to Brooklyn. Braiding the cotton and preparing it to be a wick requires two days of prep before the wax can be poured into the vessel. It is truly a labor of love. But this is also why this candle is limited edition! Rich Earth is a luxury concoction of woods and spices that create a tantalizingly warm aroma. With top notes of Amber and Mahogany and bottom notes of Coriander and Sandalwood, this is a fragrance for all candle lovers. The silky extra long fibers of the Sea Island cotton are perfect to enhance the scent of the candle in any room! Due to the long fibers of the wicks, please be sure to clip them before every relight. 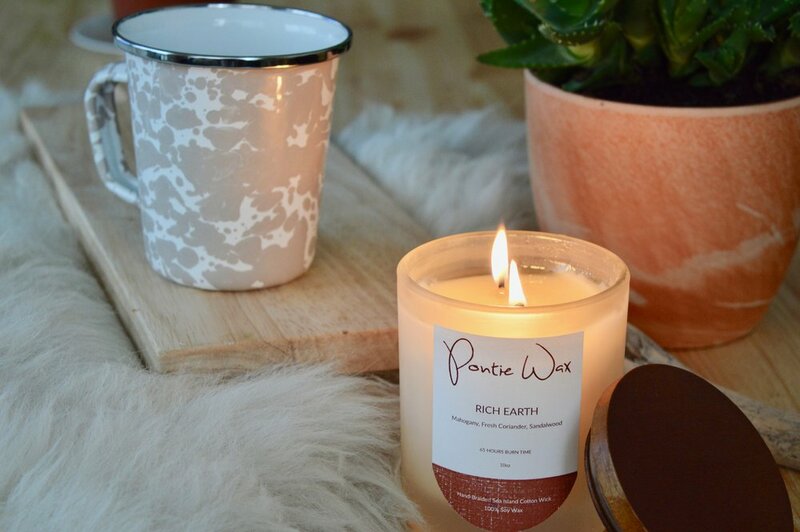 We know Pontie Wax customers love to burn our candles for hours at a time, however, this candle should not be burned for more than 2 hours at any given time. The reason is to prevent the wick from beginning to slump over into the pool of wax. This may force the flame to out on its own, or disallow you from having a nice, clean and continuous burn. Wild Orange is my dads favorite candle. He loves the sweet citrusy scents. He prefers to light this in his kitchen, than any of my other candles. But I will not complain because the man’s got good taste! I also love Wild Orange. I created this candle when I first launched in 2015 and it is still one of my favorites. It is a classically rich fragrance, that burns really well in rooms. Last year I tweaked the formula a little bit by adding in a splash of clove and sweet orange essential oil. And now it is even more of a wild and infectious scent! My dear friend Tasha over at SeedandConjure photographed this candle all the way over in Dubai. She is an amazing writer, cook, seamstress, all around creative and photographer. It’s hard to smell a candle through a computer screen. But she made it possible. Her photo styling is incredible--- it makes me want to eat the candle! Our Wild Orange candle can be purchased as a duo in our Medley Pack named ENERGY! It is paired with Lemon Ginger, another amazingly scented candle. Fig + Olive | Candle of the Month! For three months straight, Fig + Olive has been the top seller in our Etsy shop! HURRAY! This candle was created for the tender nose--- our friends that don't like the sweet, or floral or the "masculine". This candle is a delicate mix of Fig plus the sweet essence from the Olive Leaf. It is a surprisingly fresh scent and the aroma lingers in rooms for a long time after the candle has been blown out. In July of 2017, this candle was featured in VellaBox's subscription box where it hit the homes of thousands of candle lovers! Thank you all for your purchases. And continue to enjoy this amazing candle!